“Bad energy” is a universal term to describe situations or people who are not to our liking. We use the term a lot, but do we really understand it? Dubbing something as negative or bad energy shifts the blame to another object, person, or situation. If bad energy is prevalent in your life, what are you doing to drive it out? Let’s talk about what negative energy truly is and how to go about clearing it from your life. 1 What Is Negative Energy? Negative energy is not something that can be seen but is rather felt. The phrase “bad energy” explains a feeling. It is not based on solid fact but rather on the notion that we are all a conglomeration of the energy we surround ourselves with. Often, people describe negative energy as a palpable feeling or “vibe” they experience when interacting with a person or entering a new situation. Sometimes, the mood of the people in the room can instantly change the entire vibe. The vibe you feel, good or bad, can then shape the way you interact with your environment. Your home should be your sanctuary. Ideally, this is a space to unwind, relax, and escape from the negative outlooks so often found in everyday life or saturated into social media. Feeling constantly negative in your home can show that you, different relationships, or your home itself are laden with bad energy. Some people are completely unaware they are a perpetual Negative Nancy. If negativity is embedded into your daily communication, you might not even notice this is happening. Complaining is a vicious cycle fed by more complaining. It is a negative cycle that can drag you down over time. If you are struggling to see the positivity in life or are complaining excessively, it can be a sign there is negative energy in your life. A great example of this is constantly allowing the struggles of the workday to seep into your home life. If you spend hours of your evening dragging the events of the workday out for your partner rather than enjoying the quality time, you are allowing negativity to seep into the home. This issue also ties back into what topics you choose to engage in at home. Criticizing is simply complaining about people. If you are being constantly criticized by others in the home, you might start to feel down about yourself. Criticism might feel right at the time, but the words can have a lasting impact. Constantly criticizing yourself or others in your home and being criticized in return creates a culture of toxicity. This toxic nature is easy to get lost in as you wrap yourself in complaints and lose sight of the good. Who you choose to live with and what those relationships are like are extremely important in recognizing if you are surrounded by negative energy. People who are negative will feed into your negative habits. If your home, your intended sanctuary, is plagued by these overly critical and negative types of relationships, you will feel the effects. This negativity can be something as simple as constant complaining and as severe as verbal or physical abuse. Recognizing when a relationship is unhealthy is pivotal in moving toward a more positive home environment. Taking responsibility for your home and mental state is difficult. 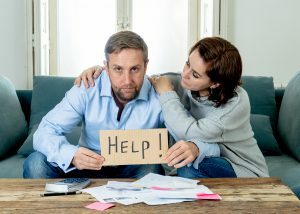 If you are in a negative environment, you may be inclined to shift blame to others in your home and life. Rather than owning you are overly critical, you instead say the other person has too many shortcomings. Rather than recognizing you are part of an unhealthy relationship, the other person is the source of all your relationship problems. Shifting blame is tempting because it reduces the pressure on you to change. Instead, it displaces the responsibility onto someone else. At the end of the day, the best person to clear out negativity in your home is you. A house filled with disorder and clutter can actually be reflective of negative energy. Your home surroundings might be a source of frustration that spills over into negative energy. Clutter blocks energy flow in a home and in some ways, creates feelings of anxiety as well. Recognizing your home is cluttered can be the first step in identifying other areas of negativity in your home. If you successfully have identified areas of your life where negative energy is flowing from, you are ready for the next steps. Clearing bad energy is not an easy task and won’t be accomplished overnight. In some cases, it might require a healthy assessment of your state of being, your home surroundings, and difficult conversations with loved ones. However, by approaching all of this with an open and honest mindset, you can take the first steps to clearing negative energy from your home. Physical space speaks volumes to the type of environment you live in. Perhaps your home is a small, overly packed studio that makes your world seem too small. Perhaps years of issues have built up in the form of clothes and other belongings. 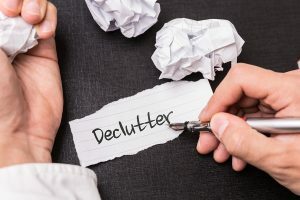 No matter what your clutter looks like, de-clutteringde-cluttering is a necessary first step toward clearing negative energy. This process might take a while and can’t be accomplished in the space of a day. It can be mentally draining as you shift through belongings that bring about old memories. Remove and donate items that don’t bring joy to your life. Find things that no longer hold significance to donate, sell, or trash. It’s important to do this in stages and always be respectful of your mental health, even if that means tackling an area of the home one weekend at a time. Positive surroundings stem from several sources. Cleansing a negative space means creating positive energy through people, movies, books, self-reflection, retreats, and more. This is a very individualized step that must focus on what works for you. This really entails being mindful of your surroundings, how you spend your time, who you spend your time with, and the state of your being. Criticism can be constructive, but if you are seeking to cleanse negative criticism, chances are your criticism is not constructive. Rather than instructing peers on how to act, show them. Rather than demanding optimism and shutting down gossip, demonstrate these qualities through optimism and kindness. Basically, good energy will be created through actions rather than words. 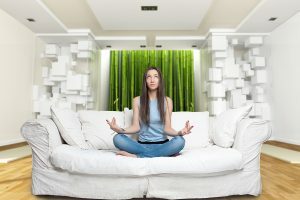 If you are a person who requires physical action to cleanse your surroundings, you might need a little more than self-reflection to reset your energy levels. One of the best ways to accomplish this is through burning white sage. A home filled with negative energy will benefit from air purification. This is exactly what white sage accomplishes. White sage can be found in natural food stores, farmers’ markets, and even bookstores. Crystals or essential oils are also useful in cleansing the home of negative energy. Again, this is about what works for you. Don’t be afraid to try something new though! Start at the doorway with your lit sage bundle. Move through each room, counter clockwise. Be sure to sage all doorways, corners, windows, closets, and the bed area. If the negative energy feels internal, sage yourself. 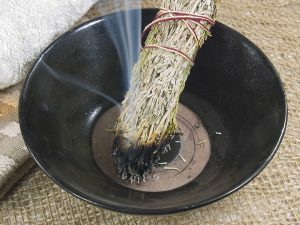 If you are in a new home or apartment, sage from the start to cleanse bad energy from construction workers or previous residents. This home is a fresh start for you, so don’t let a stranger’s bad vibes start things off wrong. Consider sea salt, a natural detoxifier. It can be scattered inside the home’s perimeter, left overnight, and vacuumed the next day. Also consider leaving a bowl of sea salt water under the bed to detoxify your body overnight. Overall, cleansing negative energy from the home requires acts of both mental and physical resilience. If you approach cleansing with a positive and open heart, you will find the benefits are worth the effort. Self-reflection is key in understanding the source of your negativity in order to move towards a more positive tomorrow.